More than a dozen Asian and Pacific Islander American athletes will represent Team USA at the Summer Olympic Games in London, and several more will serve as back-ups or replacements. The competitors will join hundreds of fellow Americans in their quest to reign in their respective sports and bring home the gold. 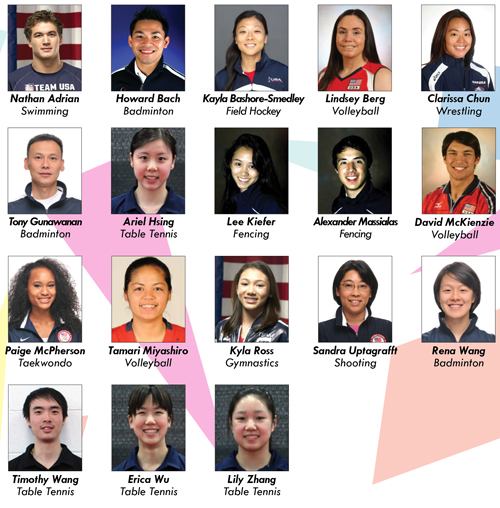 Below are Asians and Pacific Islander Americans who are qualified to compete in the 2012 Olympics. Adrian of Bremerton, Wash., 24, began swimming at the age of 5, after seeing his brother and sister take up the sport. Adrian’s mother, who was born in Hong Kong, is a nurse for the Bremerton School District and his father is a retired nuclear engineer. Adrian won gold when he swam in the 4×100 meter freestyle relay at the 2008 Olympics in Beijing. He will compete in the 100-meter freestyle and 4×100-meter freestyle relay events in London. Adrian holds a pre-med degree from the University of California, Berkeley, and hopes to one day become a doctor. Bach was born in Vietnam in 1979 and came to the United States when he was 3. By the encouragement of his father, he began playing badminton at a local YMCA in San Francisco as a child. His father, also an avid player, served as Bach’s training coach over the next decade. Bach’s talents earned him a spot to compete in the 2004 Olympics in Athens. One year later, he and Tony Gunawan won the men’s doubles title at the 2005 World Badminton Championship. The victory marked the first time an American badminton team ever medaled at a world championship. In 2008, Bach and another partner became the first U.S. badminton team to reach an Olympics quarterfinal. Bach reunites with Gunawan this summer to compete in the men’s doubles event in London. South Korean-born Bashore-Smedley grew up in Shoemakersville, Pa. and currently lives in Chula Vista, Calif. She first picked up a hockey stick when she was 15, when a high school coach suggested that she give the sport a try. Her skills caught the attention of college recruiters and earned her a scholarship to Indiana University, where she led the school to its first-ever NCAA tournament. Bashore-Smedley was also named the 2005 Big Ten Player of the Year and became the school’s sole First Team All-American. That same year, she also completed a degree in biology and chemistry. In 2008, Bashore-Smedley was part of the U.S. women’s field hockey Olympics team, which finished eighth overall. This summer, she joins a roster of 16 women who will compete for the gold in London. Berg began honing her volleyball skills on the island of Oahu, Hawaii, where she grew up. In 1998, Berg graduated from Punahou High School in Honolulu, alma mater of President Barack Obama. She went on to play volleyball for the University of Minnesota. There, she led the program to its first Sweet 16 appearance and became a three-time All-Big Ten Player of the Year. Berg competed in her first Olympics in Athens in 2004, where the U.S. women’s team took fifth place. She took home a silver medal at the 2008 Olympics in Beijing. The volleyball star has a mixed heritage. Her mother is Hawaiian-Chinese-Portuguese and her father is Lithuanian. Chun will make her second Olympics appearance this summer. Standing at 4’11”, she is a force to be reckoned with. In 2008, the Honolulu native became the first Hawaiian-born wrestler to compete in the Olympics and placed fifth overall. In addition to wrestling, Chun enjoys water polo, swimming, gymnastics, judo, and bowling. She is of half Chinese and half Japanese heritage and is currently studying communications at the University of Colorado. Indonesian-born Gunawan has won international stardom for versatility and consistency in his sport. In 2000, while representing Indonesia, he won a gold medal in men’s doubles at the Olympic Games in Sydney. In 2001, he and a different partner won gold for Indonesia at the World Championships in Spain. In 2005, representing the United States, Gunawan and partner Howard Bach won the men’s doubles title at the World Badminton Championship. Gunawan moved to the United States in 2002, but because he was still in the process of obtaining his U.S. citizenship, he was unable to represent Team USA at the 2008 Olympics. Gunawan became a U.S. citizen in September 2011 and has reunited with Bach to represent Team USA at this summer’s Olympic Games in London. Born and raised in California’s Bay Area, Hsing began playing table tennis when she was 7 and, at the age of 15, became the youngest woman to win the U.S. National Championships in the sport. She defended her title at the U.S. National Championships in 2011. Hailed as a ping-pong prodigy, Hsing’s talent has impressed the likes of Warren Buffett and Bill Gates. Buffett is so fond of her that he has invited her to play against himself and shareholders at his company’s annual meetings. Hsing’s father, who grew up in Taiwan, and her mother, who grew up in China, are also avid table tennis players. No U.S. competitor has ever medaled in table tennis at the Olympic Games. Hsing hopes to be the first. Keifer was born in Cleveland and currently lives in Lexington, Ky. The 18-year-old, whose mother is Filipino, comes from a family of fencers. Her father fenced for Duke University, her older sister fences for Harvard University, and her younger brother recently won the Cadet European Cup in fencing. In 2011, Kiefer became the only fencer in the world to achieve individual podium finishes at the Senior, Junior, and Cadet World Championships. She is the youngest member of the 2012 U.S. Olympic fencing team. Massialas follows in his old man’s footsteps as he heads to the Olympics this summer. His father, Greg, is a three-time fencing Olympian and one of Alexander’s current coaches. In 2010, Massialas became the youngest person to win a men’s foil Division I National Championship, at the age of 16. In 2011, he defended his Cadet World Championship title and became the youngest athlete to medal at the Seoul World Cup, where he won bronze. Massialas was born in San Francisco and plans to attend Stanford University this fall. His Chinese mother was born in Taiwan and immigrated to the United States during her mid-teens. McKienzie will make his Olympic debut in London this summer, as the U.S. men’s volleyball team seeks to defend its 2008 gold medal. Although both of his parents played and coached volleyball, McKienzie really became interested in the sport when his sister, Joy, encouraged him to play. Joy was a part of Long Beach State University’s 1993 NCAA national championship team. He currently works as an assistant coach. McKienzie’s parents met in the Philippines, when his late father, William, coached the country’s national volleyball team, of which McKienzie’s mother, Elvira, was a member. Elvira, who is Filipina, told Northwest Asian Weekly that the Philippine government had hired William and other American coaches to train Filipino athletes headed to the Asian Games. The couple married in the Philippines in 1971 before moving to Colorado, where they raised their children. In 2001, David graduated from Long Beach State University, where he was a three-time All-American volleyball player. McPherson was born in Abilene, Texas and adopted when she was just four days old. She graduated from Black Hills Classical Christian Academy in 2009 and currently attends Miami-Dade College in Florida. In 2011, she earned a silver medal at the Pan American Games and won the Outstanding Female Athlete award at the USAT National Championships in 2009. In 2008, she received the Chris Canning Award of Excellence. McPherson is one of four American taekwondo athletes that will compete in the 2012 Olympics. The 21-year-old, who has earned the nickname “McFierce,” is half Filipino and half African American. Miyashiro will compete in her first Olympic games in London this summer, as Team USA seeks to turn its 2008 silver medal into 2012 gold. She will serve as the team’s reserve libero, a defensive specialist position. Miyashiro is of Japanese, Chinese, Hawaiian, Irish, and German descent, and comes from a family of athletes. Her mother was an All-American college volleyball player for the University of Hawaii and her father was a college football player. Miyashiro grew up in Honolulu and graduated from Kalani High School. She later attended the University of Washington in Seattle, where she holds the university’s record for career digs. She graduated in 2009 with a degree in interdisciplinary visual arts. Ross, 15, is the youngest person on Team USA’s gymnastics roster. She was born in Honolulu and currently lives in Aliso Viejo, Calif. Ross, who has the nickname “Mighty Mouse,” is a two-time U.S. junior all-around champion. She made her senior international debut at the Pacific Rim Championships in March, where she finished second all-around. Two weeks later, she won all-around gold at the City of Jesolo Trophy competition in Italy. Ross earned the second-highest scores on the uneven bars at the 2012 Olympic trials. Her father is Japanese and Black, and her mother is of Filipino and Puerto Rican descent. Singaporean-born Uptagrafft will make her Olympic debut in London this summer as she represents the United States in the women’s 25-meter sport pistol and 10-meter air pistol events. Her husband, Eric, will make his second Olympic appearance as a member of the U.S. rifle team. Sandra is a Petty Officer 1st Class in the United States Navy Reserves and is also a Microsoft certified systems engineer. She and her husband live in Los Angeles. Wang is the sole American that will compete in women’s badminton at the London Olympics, set to compete in singles. The Southern California native typically partners with her sister, Iris, but Iris did not make the Olympic trials. The duo has succeeded around the globe in other competitions, winning third place at the 2012 Polish Open International Badminton Championships and silver at the 2011 Pan American Games. Last year, Wang won the 2011 Peru International badminton championships in women’s singles. Wang is a biology major at the University of California, Los Angeles. She speaks Mandarin. Wang of Houston, 20, is the sole men’s table tennis competitor that will represent the United States at the London Olympics. He will compete in the singles events. Wang won the men’s singles competition at the 2010 U.S. Nationals and placed third in 2011. Although he plays with his right hand, he is naturally ambidextrous. The Chinese American was introduced to table tennis when his dad brought him to clubs to watch his brother play. Wu of Southern California, 16, started playing table tennis after a family friend suggested that she give the sport a try. Around age 9, she dropped all other activities to focus on table tennis, and began taking weekly lessons. The right-handed hitter won a bronze medal alongside teammates Ariel Hsing and Lily Zhang at the 2011 Pan American Games. She also won the 2011 USA women’s doubles competition and was a semifinalist in the singles tournament. Wu will compete in both the singles event and team events at the London Olympics. Zhang of Palo Alto, Calif., 16, is one of three young women, all Chinese American, who will represent Team USA in the London table tennis events. Zhang won a singles bronze medal at the 2011 Pan American Game and also earned a team bronze, alongside teammates Hsing and Wu at the competition. In 2009, she won the Canadian junior open singles event. Zhang is a right-handed hitter. Coughlin grew up in California’s Bay Area, and began swimming lessons at a local YMCA when she was 10 months old. She began swimming competitively at age 5. Coughlin took home five medals at the 2004 Olympics in Athens and, in 2008, became the first female athlete to win six medals in one modern Olympic Games. Coughlin graduated with a bachelor’s degree in psychology from the University of California, Berkeley, in 2005. She is of one-fourth Filipino and three-fourth Irish heritage. Her mother is from Cavite City, Philippines. Neal, 17, qualified for the 2012 Olympics when she finished fourth in the 100-meter freestyle event at the U.S. Trials. Neal, who grew up in Brooklyn, N.Y., is the second female swimmer of African American heritage to represent the United States at a Summer Olympics. She is also half-Chinese and speaks Cantonese and Mandarin fluently. Her mother emigrated from Hong Kong as a teenager. In 2011, Neal won a gold medal in the 100-meter freestyle and a silver medal in the 50-meter freestyle at the World Junior Champs. U.S. goalkeeper Swensen competes in her second Olympic Games this summer. Swensen was a member of Team U.S.A. when the women’s field hockey team placed seventh in Beijing in 2008. In 2011, she was selected to compete in the Pan American Games team but was unable to participate after sustaining a knee injury during practice. Formerly Amy Tran, Swensen is part-Vietnamese. She married longtime boyfriend Mark Swensen in April 2010. Swensen was born in Harrisburg, Pa. and studied massage therapy at the University of North Carolina, Chapel Hill. Pinpointing shades is simpler and you can get the jump on your enemies. easier. Many might be ported to your other portable devices, too. Come to think of it, Natalie Coughlin (swimming) and Logan Tom (volleyball) are of Asian heritage too. Funnily enough there are Asian-Americans competing for other countries too, like Ali Riley (Chinese heritage) who plays for New Zealand’s football team. What about Amy Tran Swensen, goalkeeper for the women’s field hockey team? She is of Vietnamese heritage.